It is thought that pukeko first arrived in Aotearoa during the Pliocene (3-5 million years ago). Finding a land with abundant food and no mammalian predators the species evolved into a more efficient form – flightless and large. 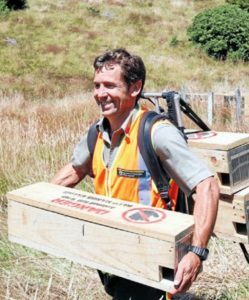 With the arrival of predators in the last few hundred years this strategy proved most inappropriate and the species we know as takahe are now in danger of extinction. 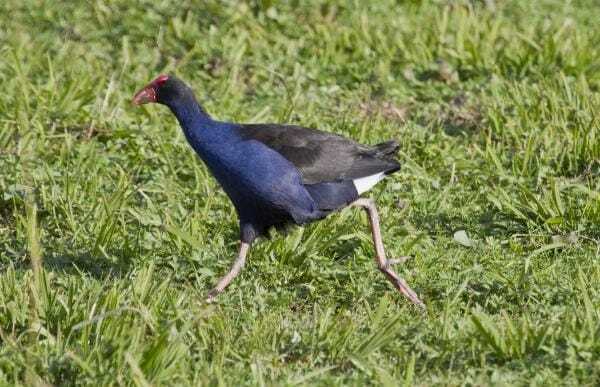 A more recent arrival of the same Australian swamphen has retained its form as the pukeko we know today. It is a distinctively blue and black hen-sized bird with a red bill and frontal shield and long red legs. As it walks the tail flicks, showing the white under-tail coverts. It is most often seen on the ground in swampy country where it feeds mainly on vegetation but not being averse to large insects or other meaty prey. In rural areas it can be a nuisance, preferring newly planted vegetables to foraging in the wild. In the park it is frequently seen (and heard!) 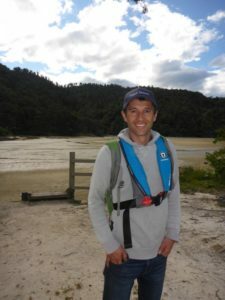 at Totaranui, Awaroa and Marahau. It will fly when it needs to and is occasionally seen perching in a clumsy manner. The pukeko nests on the ground, the small black young being mobile immediately after hatching. Domestic relations are complex with parentage not always as it seems, other adults may assist with nest duties. The native pukeko has done so well in Aotearoa that it may be shot in season by licensed hunters – not in the national park!